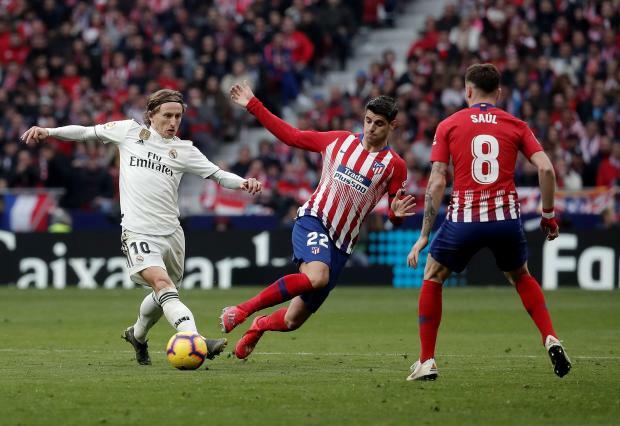 Luka Madrid controls the ball ahead of Alvaro Morata and Saul. Thibaut Courtois overcame the jeers - and a barrage of toy rats - while Gareth Bale delivered a timely reminder of his talents as Real Madrid beat Atletico Madrid 3-1 in a feisty city derby on Saturday. Bale's finish ended their hopes of a comeback after Sergio Ramos' penalty put Real in front at half-time, with Antoine Griezmann earlier cancelling out Casemiro's acrobatic opener.